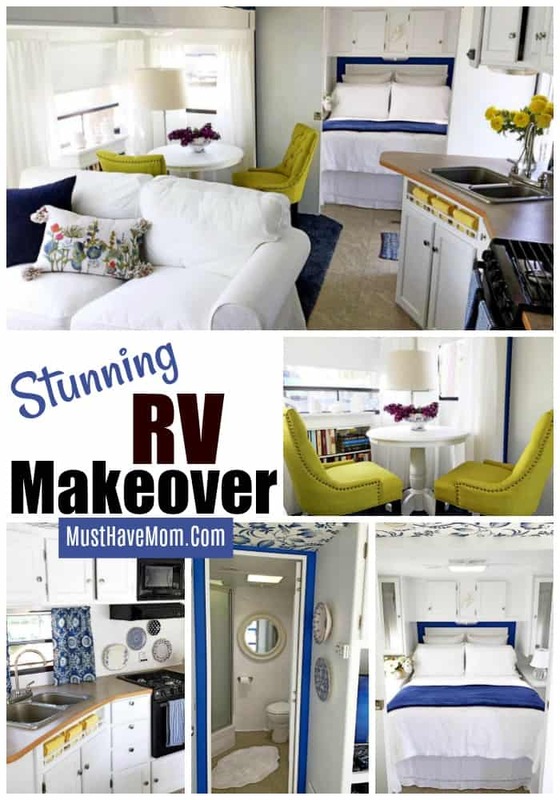 I am obsessed with RV makeovers! We did an RV remodel on our 32′ bumper tow travel trailer a year ago and you all went crazy for it. 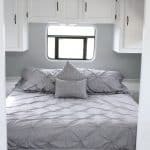 I spotted this gorgeous RV renovation that fellow camper, Wendy, did and I just had to show it to you! It is simply stunning and straight out of a magazine. She’s so talented and I know this makeover will inspire your creative juices!! 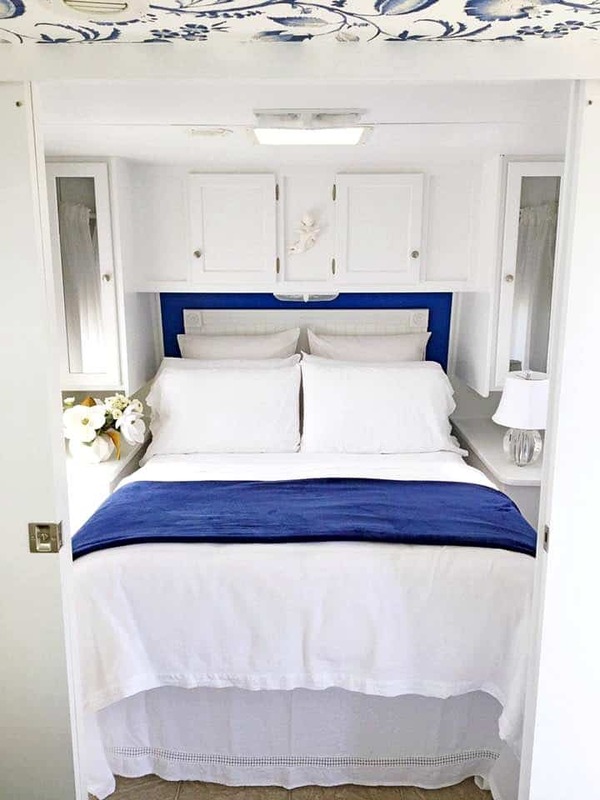 Perhaps what is so striking about this RV renovation is the stark contrast in the before and after photos, but what is really captivating is the attention to detail! Wendy really outdid herself on this makeover and she’s fondly named her camper “Maxine”. We think the name suits her perfectly! Below is the before photo and the stunning after photos! Gone is the outdated booth and couch and in its place is a stunning seating arrangement. I love how she rearranged the space to be more efficient and inviting. The loveseat is from IKEA It feels so much cozier and like a home. The new color palette features bright white to make the space bright and airy, mixed with gorgeous blues and pops of yellow and green. 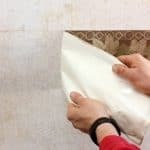 Don’t miss that gorgeous wallpaper ceiling either! That is regular wallpaper on the ceiling and boy does it add an amazing pop to this makeover. Wendy tells me her neck will never be the same! I can only imagine her level of patience in doing this. She’s amazing! In the kitchen, the cabinets have been painted white which gives a fresh feel to the space and makes the countertops look new again. The white cabinets even bring new life to the appliances! 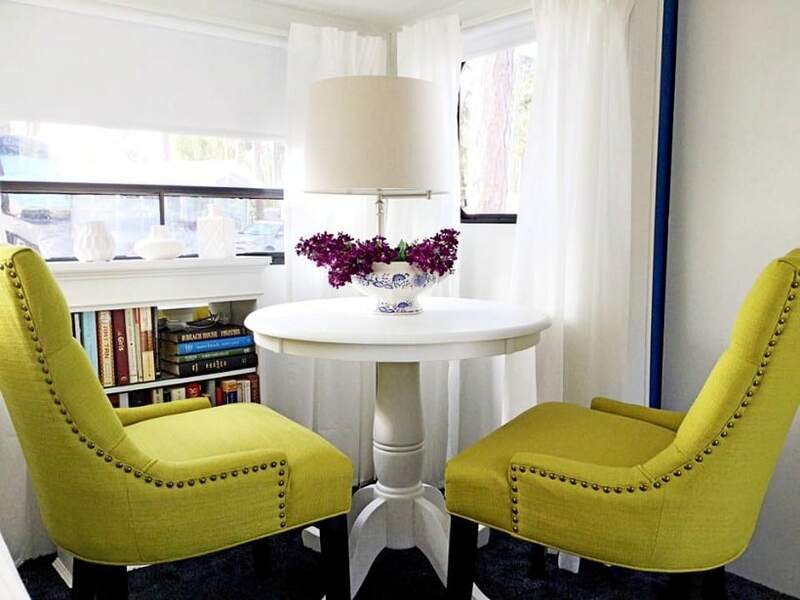 Add in pops of blue and yellow in the towels and curtains and you have a stunning transformation. 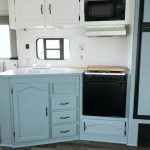 Not sure how to paint cabinets in a camper? 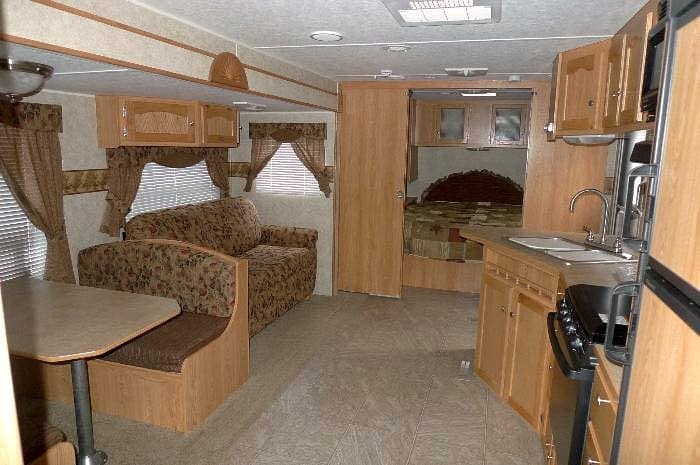 Check out my RV remodel for instructions on how I did it. One thing I always struggle with is comfortable seating in an RV. This table and chairs from Wayfair solves that problem and delivers a sturdy, yet comfortable seating space. Since there are no arms on the chairs, they don’t take up a lot of space, but deliver in comfort and style. 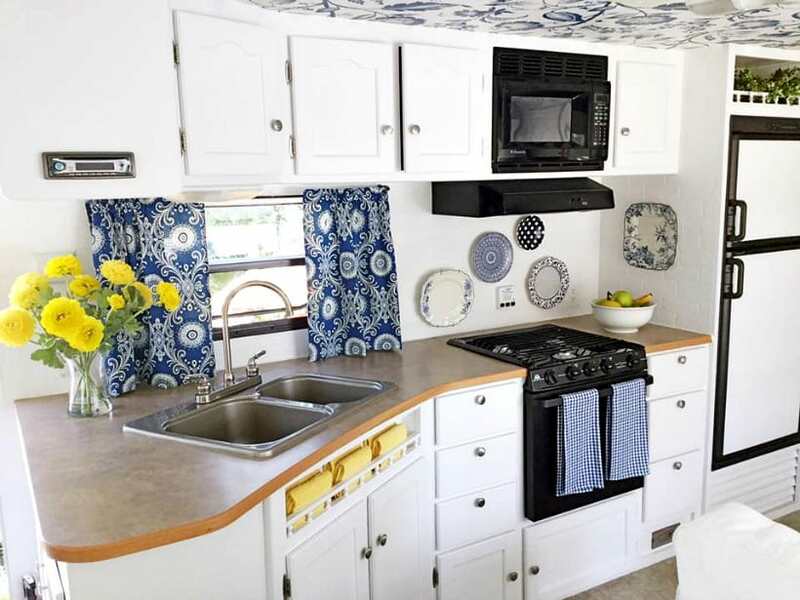 Add in curtains and roller blinds and remove the RV valance and you’ve got a bright, cheery breakfast nook! 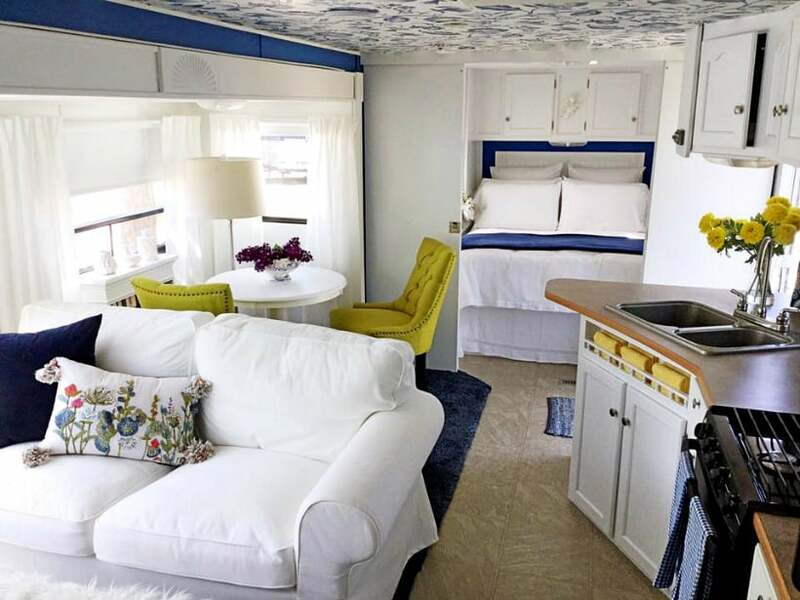 The RV master bedroom makeover is simply stunning and so inviting. I’d love to crawl into that bed after a long day outdoors! The blue accent wall behind the white headboard makes for the perfect pairing. Add in white bedding and a small lamp and you’ve got the perfect relaxing space. 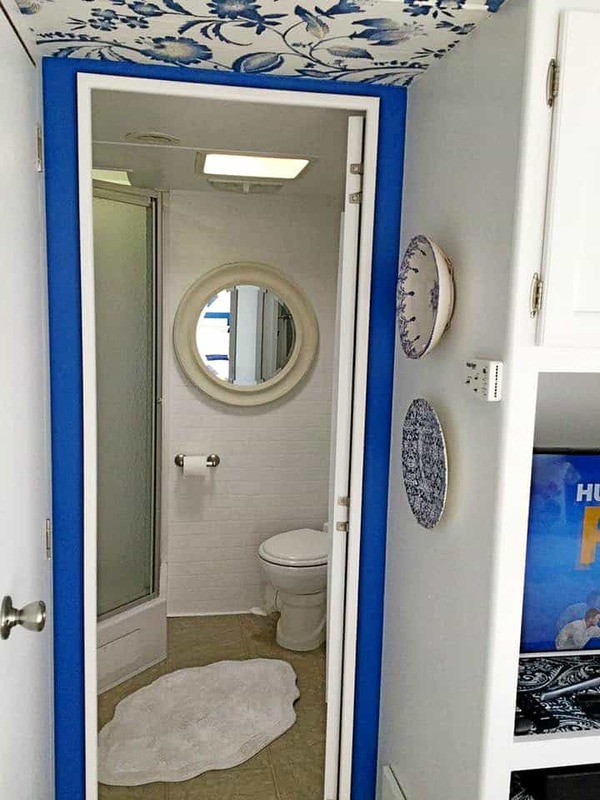 The RV bathroom makeover turns a small bathroom into an inviting oasis. The faux brick wall is perfect for this space and add a mirror on that wall to create the illusion of a bigger space. Looks so inviting! Did Wendy use Beyond Paint for her makeover?? After reading your post, seeing the beautiful results, and your follow up report on the paint, I ordered a Bright White Kit. We’re still in the Repair Stage (leak). Waiting for sunny weather. But so excited & can’t wait to see our Annie’s makeover! The RV is beautiful. My question is what happens to the furniture when the pop-out is closed and the camper is on the road? 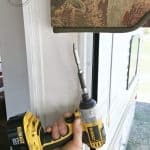 I’m new to the RV world and am still trying to figure out how it all works. Thank you. Thank you! Wendy did a wonderful job on the makeover. The couch can be turned so the slide can be brought in. The chairs can be laid on their backs. The table stays in place. Bungees work great to secure books on bookshelves without having to move them. Any lose decor goes into a basket for the trip. seriously precious – this is my dream! I want to do this so bad!!! Thank you Kim! It’s so much fun to do a makeover!! We don’t own a camper, but friends of ours do. I’ve always been a little obsessed with how cool they can be and the great use of storage! Would love to see a pic of the entertainment area and how she configured that…..Does she have any pics? I absolutley love the ceilings!!!! She didn’t have any photos of that area to share. Isn’t that ceiling amazing?! I’m in love with it. Oh please, please tell us the name of that dreamy wallpaper used inside “Maxine”. I muse find it! I’m in LOVE!!!! Maxine is deliriously gorgeous!!!! What a fantastic job!!! Oh thank you so much! I wish I knew the name of the wallpaper but I do not! Isn’t she just a beauty? I just finished redoing our 5th wheel and I wish I had done that to the ceiling. Although maybe later! I’m in total aww of this beautiful ceiling! What a lovely job! Thank you and congrats on your makeover! That’s a great feeling when you finish it. It’s wallpaper! Good luck with your makeover. I wish I knew! I’m not sure what exactly she did for the ceiling.